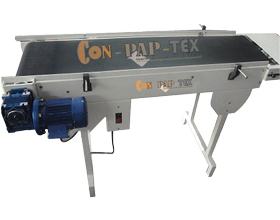 Con Pap Tex has been manufacturing Batch Coding on Conveyor with Variable Speed from India. S.S and M.S types of Conveyors with high quality System for Batch Coding process with adjustable guide, standard gear box with less vibration. International Standard of for Batch Coding for Label, Carton, Pouch and many more. S.S. & M.S. VARIABLE / FIX SPEED BELT-CONVEYOR WITH ADJUSTABLE GUIDE. Speed: Variable Speed With Vfd, Standard Motor Gear Box With Power Regulator & On/ Off Switch. Note : Other Specifications Are As Above. Vibration less Motion Which Gives The Best Coading Thrue Out The Length. Extra Feeder Plate For Resting The Bunch Of Product And Sloper Output Plate For Product Easy Outward. Free Attachment Facility For Your Encoder Of The Inkjet Machine On Our Roller Shaft With Suitable Design. S.S. VARIABLE SPEED BELT-CONVEYOR WITH ADJUSTABLE GUIDE. Copyright ©2016 offlinebatchprinting.com. All Rights Reserved.